Astronomers have discovered 12 new moons in orbit around Jupiter, the largest planet of our solar system. Of the newly-discovered moons, the oddest is a small rocky world dubbed Valetudo. Just one kilometre across, Valetudo orbits "the wrong way" and could one day smash into one of its neighbours. Almost by accident, astronomers have discovered 12 new moons of Jupiter – including one that orbits "the wrong way" compared to its neighbours, putting it at risk of a violent collision. Jupiter was already known to have 67 moons – more than any other planet in our solar system. This latest discovery brings the total up to 79. Astronomers had been scanning the sky for undiscovered objects in the outer solar system, beyond the orbit of Neptune (where a hypothetical "Planet Nine" might reside). Since Jupiter was due to be in the same part of the sky, they were able to "kill two birds with one stone," and search the area near Jupiter as well, as astronomer Scott Sheppard of the Carnegie Institution for Science in Washington DC puts it. 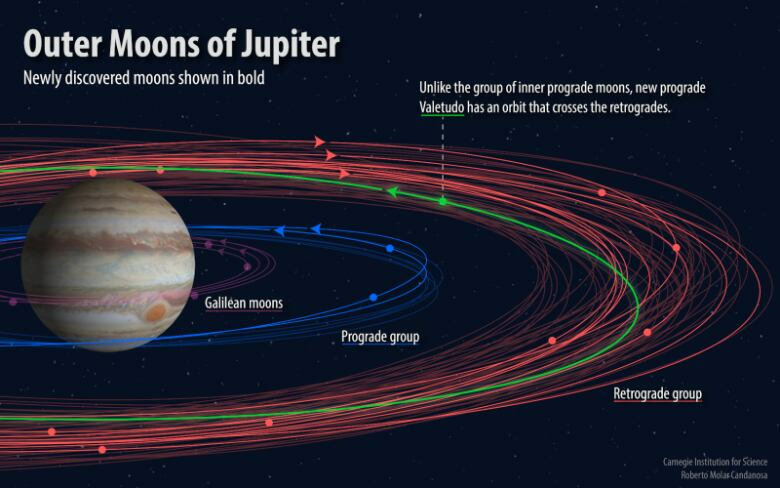 Of the newly discovered moons, two move in the same direction that Jupiter rotates (the "prograde" direction), while nine outer moons move in the opposite direction ("retrograde"). The astronomers believe that these retrograde moons are space rocks that happened to be captured by Jupiter's gravity, whereas the prograde moons might date back to the formation of Jupiter itself, some five billion years ago. But the most intriguing of these new moons is the twelfth one, dubbed Valetudo, after one of the great-granddaughters of the Roman god Jupiter. Although Valetudo orbits among the retrograde moons, it actually moves in the prograde direction. It's a bit like driving the wrong way down the highway, as Sheppard puts it. That means Valetudo could one day collide with one of its neighbouring moons, an event that would spell doom for the diminutive body at just one kilometre in diameter. However, such a collision isn't likely to happen anytime soon; Sheppard says the big smash-up could happen anytime from 100 million years to a billion years from now. In fact, the little moon may be the remnant of a larger body that has already undergone multiple collisions, over hundreds of millions of years. The moons were first spotted using the four-metre Victor M. Blanco telescope at the Cerro Tololo Inter-American Observatory in Chile, which had recently been equipped with an ultra-sensitive camera known as the Dark Energy Camera. However, a year of follow-up observations were needed to confirm that these new objects were actually orbiting Jupiter. 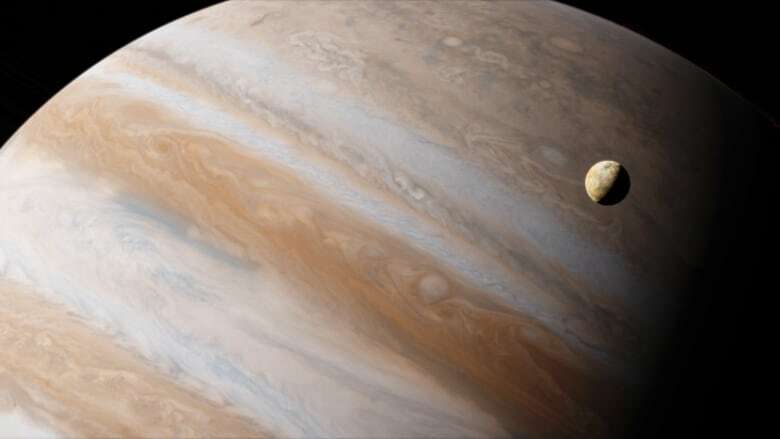 The astronomers believe that Jupiter could have hundreds of as-yet undiscovered moons that are one kilometre or more in diameter. In 2014, Quirks & Quarks spoke with Dr. Sheppard about a dwarf planet discovered in the outer solar system. Earlier this year we looked at the giant cyclones brewing on Jupiter's surface.